It’s not that long since I reviewed the French violinist Devy Erlih’s 1969 cycle of Bach’s Solo Sonatas and Partitas on the Doremi label. That was Volume 1, and I ended my review in eager anticipation of the next instalment. Well, here it is, with the violinist again featured in solo repertoire, sourced from the back catalogue of the French Adès label, a company that ran from 1953 to 1988. These newcomers are later recordings, dating from 1973. I provided some biographical deatils of the violinist in my previous review, so I’ll refer readers in need of some background to that. 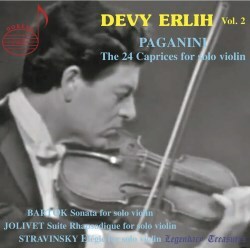 Along with Ruggiero Ricci and Michael Rabin, Erlih was one of the early pioneers of Paganini’s 24 Caprices in the recording studio. Today any violin virtuoso worth his salt has embraced them, and recordings in the catalogue are legion. Accardo, Perlman, Ehnes and Kayler, are just some of the versions that I’ve come to like. What singles out the good from the mediocre for me is the range of expression, character and musicality the artist brings to these works. Erlih has a superlative technique, but he also brings these elements of artistry to his performances. I admire his fire and passion, as well as his sense of fantasy. The outer sections of No. 11 are ardent, and sing with lyrical intensity. Intonation is spot on, especially evident in the octaves of No. 3. The recording also showcases his impressive bowing skills. The clean, crisp spiccato of No. 5 and the up-bow staccato and ricochet of No. 7 will win the admiration of many a fiddle player. In No 24, we get a bit of everything - scales, arpeggios, left hand pizzicatos, octaves and tenths, double and triple stops, all played with precision and panache. Bartók’s Solo Sonata was written in 1944 in response to a commission by Yehudi Menuhin, who collaborated with the composer throughout its gestation. It calls for a technique of the highest order. Menuhin initially considered it unplayable, but he later went on to premiere and record it. Erlih takes a monumental view of the Tempo di ciaccona and in the Fuga which follows the contapuntal lines are clearly teased out and defined. There’s some soothing contrast in the emotionally fragile ‘Melodia’, paving way for a folk-orientated finale full of gusto and bite. André Jolivet’s Suite Rhapsodique for solo violin dates from 1965, and seems etched along the same lines as the Bartók. In five movements, its flavour is oriental and its lyrical vein is more pronounced than the earlier work. I’ve never heard it before, but I was particularly taken by the central Intermezzo, which is like an improvisation. The finale is a spiky affair, full of bounce, realized by harsh pizzicatos and dissonant double stops. As a point of interest, Erlih was Jolivet’s son-in-law, and premiered this work in 1972. Stravinsky’s short Elégie was written in 1944 in memory of Alphonse Onnou, the founder of the Pro Arte Quartet. The work started life as a piece for viola, and has a mournful demeanour. Recorded under studio conditions, though the venue isn’t given, the solo violin is profiled in a warm, intimate acoustic. Violin fanciers will welcome these wonderful, musically informed performances back to the catalogue, and it is an added bonus to have the Jolivet and Stravinsky rarities. Will there be a volume 3? I hope so.